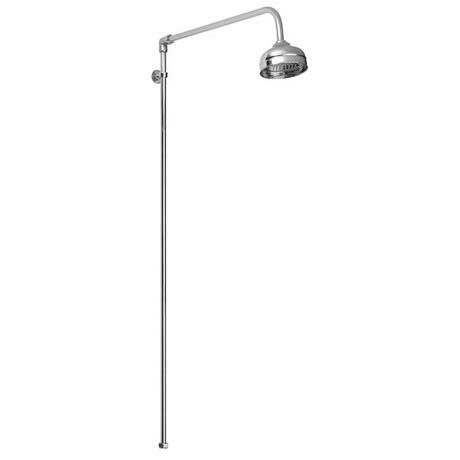 The traditional shower rigid riser kit including swivel from Ultra is comprised of exposed pipework with a 4" Chrome Apron shower rose on an adjustable ball joint. Capture the aura of a bygone time. Please note: this rigid riser can be trimmed down, but this does void the warranty. Q. Can anyone tell be distance between wall and pipe centre (to fit an existing shower valve) and also if the cross piece can be shortened - picture looks like its got an elbow joint! Hi, the pipe work can be shortened, there is an elbow used and this is a compression fitting and pipes can be cut to suit requirements. The wall to pipe centre is 35mm. Hope this helps, please let me know if you have any further questions! Q. Hi what is the mimimum pressure needed for this shower and the twin expposed shower valve that goes with it? Hi, here is a short guide to product pressure requirements. LP - 0.1 bar min, LP2 - 0.2 bar min, MP - 0.5 bar min, HP1 - 1 bar min, and HP2 - 2 bar min. I hope this helps! Hi Dave, the riser could be fitted so that it wasn't at a right angle from the wall. once it is fitted it cannot be turned though. I hope this helps, please let me know if you have any further questions. Thanks. Hi Joni. This isn't suitable as most electric showers won't output the pressure required. Sorry we couldn't help more today, please get in touch if you have any further questions. Q. Please can you tell me what the diameter of the pipes are? 15, 18, 22 other? 0 out of 10 found this question helpful. Unfortunately the head can not be changed however the product number - AG302 will fit with this shower kit. Q. Hello, can this product be fitted with a flexi hose connector at the bottom to enable it to be connected to an existing bath mixer tap with shower connector? Hi Gav, this can only be attached to an exposed shower valve. Q. Can the length of the pipe to the rose be shortened from 505mm? Hi Pete. The Beaumont rigid rise kit can be cut down to the required size. Hope this helps. As expected looks smart fits well with our victorian shower room. This product is very good, I used it to replace a conventional flexible hose shower head, the Beaumont allows better mixing of the hot and cold water and the shower head is just brilliant. This is the second time I have ordered this for a bathroom renovation project. It looks good in our Victorian house and I would have no hesitation in recommending it to others. I am very happy with the Rigid Riser Kit, it is just what i wanted in my bathroom and looks great.